InterAct Theatre begins its 31st season with a world premiere by a Philadelphia playwright about gentrification in a Philadelphia neighborhood. Salt Pepper Ketchup is a co-production with Passage Theatre of Trenton. This is so appropriate since for 31 years InterAct Theatre has produced and co-produced an incredible number of worlds, American, and local premiers. The InterAct audience wants fresh, compelling, and relevant theater and Producing Artistic Director Seth Rosin has hit another jackpot with Salt Pepper Ketchup by Josh Wilder. John and Linda Wu have been a mainstay of the Point Breeze area in South Philly. Their Chinese “fast food” store has served the inner-city neighborhood for years. Their neighborhood is undergoing rapid influx of “white people” to gentrify the area. This new disruptive wave is represented by the opening of a co-op nearby. The story is how the individuals deal with their unique perceptions of the events. Jerrell L. Henderson’s crisp, intelligent direction emphasizes the unique voices of not only the groups but the individuals in the groups. The writing is so realistic that you believe you are another customer watching something real occurring. The opening scene for example is three African American men in the Super Star (the name of the Wu’s restaurant). Raheem, Tommy, and Boodah give us a crash course on the history of the Wu’s store. We feel the tension in the language used. Josh Wilder adroitly layers the development as the co-op and the Wus continue their strained relationship represented by their front man, Paul. In addition to a riveting story, director Henderson has assembled a uniformly stellar cast. 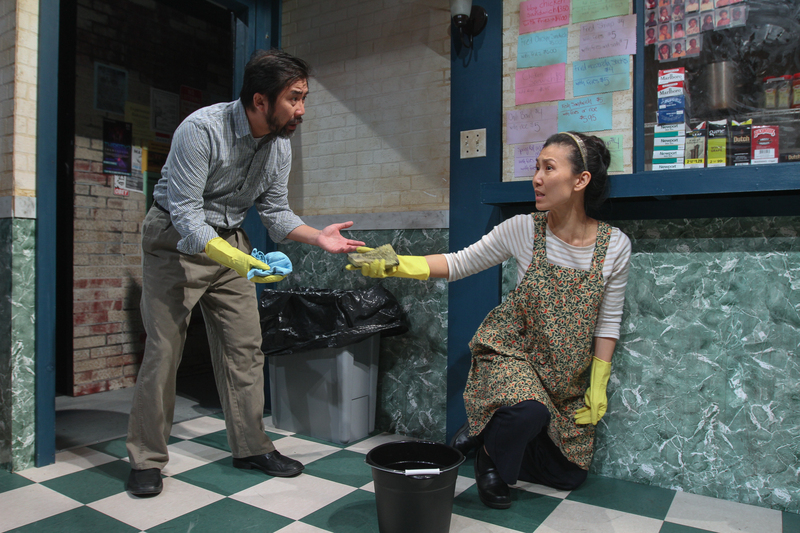 As John and Linda Wu, Fenton Li and Chuja Seo not only express the frustration of seeing their dreams become a victim of gentrification, they also capture their internal struggle based on cultural ethos. Raheem (Jaron C. Battle) is a young man who is angry and is looking for “his.” Tommy (Mark Christie) is college educated but has just seen his father’s business destroyed by the coop. He can’t reconcile what he has learned with what he is experiencing. Boodah (Richard Bradford) is the neighborhood philosopher. He is older and provides both guidance for the younger African Americans and a conscience for the Wus. CeCe (Kendra Holloway) is a ball of fire from her first entrance. She is confident, sassy and independent. She is willing to give the co-op a chance but finds that it is not exactly as they advertise. The representative of the co-op is Paul (Justin Pietropaolo), an Ivy League, vegan, do-gooder who believes that the co-op is the best thing to happen to neighborhood. The point that comes across strongly is that he is so convinced that his way of life is superior and therefore it is okay to restructure the neighborhood to their design. His co-worker, Megan (Miriam White) arrives in the second act to contrast Paul’s overzealousness. Writer Wilder and director Henderson take us on a journey of both discovery and self-reflection that is both entertaining and stimulating. Colin McIlvaine’s set has such a sense of realism that you think you are there. Special kudos to the stage crew that totally recreates a new space in the time of the intermission. An-Lin Dauber (Costume Designer), Robin Stamey (Lighting Designer), Larry D. Fowler (Sound Designer), and Jacqueline Holloway (Fight Chroeographer) are in lock step with the playwright and the director. Salt Pepper Ketchup runs until November 18th at the Drake. For information call 215.568.8079 or email Boxoffice@interacttheatre.org.